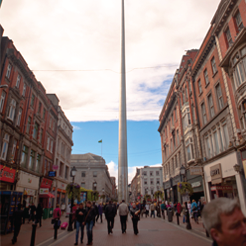 The Dublin One District, spanning Parnell Street to the Quays and from O’ Connell Street West to Capel Street is one of the two principal shopping districts of Dublin. Here you will find three shopping malls including the Ilac centre, the oldest shopping centre in the city, as well as a cinema, a large range of high street stores, restaurants, and bars lining the streets. Although the Dublin One Street district hosts same of the largest brands and stores in the city, including Arnotts, Debenhams, Argos, and Marks & Spencer, there are also plenty of unique, independent shops as well. Both Parnell Street and Capel Street house a plethora of authentic Chinese and Korean restaurants. The Dublin One District is also home to the famous Moore Street open air fruit and vegetable market, Dublin’s oldest food market. The Dublin One Area District is currently working to create and promote its own personality and brand in coordination with the We Are DublinTown team.